Even if you don’t consider yourself to be mechanically inclined or savvy with regard to automotive repair, there are a few things that you can do on your own in your home garage that will help save you money. That being said, if you truly feel unsure or uncomfortable, don’t attempt to do it yourself. 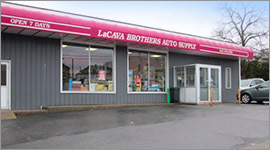 However, you can always visit LaCava Brothers in Fall River for Auto Parts and Services. Our team will help you find all of the parts, accessories, fluids, and tools that you need to get the job done right. In addition to being a reputable provider of auto supply in Fall River to both consumer and commercial clients, we also provide an array of beneficial services that you can take advantage of to extend the life of your vehicle. According to a survey posted on CarInsurance.com, the average driver in the United States goes approximately 1,000 miles per month, so that means that you should be changing your oil every three months or so, depending on your driving habits. If you go and get your oil changed every 3,000 miles, or whatever the manufacturer of your vehicle recommends, and you are paying $40-50 on average, you could be paying well over $200 a year just in fees to have it professionally done at your local lube shop. If you aren’t sure how to get started you can always talk with one of our team members, take a look at the manual that came with your vehicle to see the manufacturer’s recommendations, or you could go online and watch instructional videos on how to change oil in the make and model of vehicle that you own. Oil changes basically involve draining out the old oil, replacing the oil filter, replacing the drain bolt, pouring in the new oil, and then recycling the oil. BONUS TIP: The first time you change your own oil, you will invest a little more in tools, the oil drain pan, and of course a bit more of your time to get the job done right. 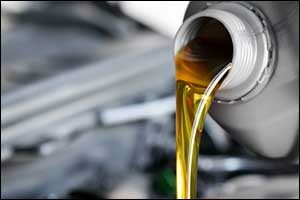 The next time you will have everything you need, outside of fresh oil and the oil filter, and it will cost even less. There’s nothing quite like the feeling of jumping in your car to go to work in the morning, only to have the battery be dead. If you are unable to jump the battery and get it going, you will likely have to replace it. If you think your battery is running low, you can bring it in to our Fall River auto parts and services for free testing. In addition to providing Fall River, MA car parts, fluids, and accessories, we also provide a few services like this to help our customers determine whether its time to buy a new battery or not. It is important to understand how a battery works so that you won’t get shocked. Batteries are not dangerous, but you want to make sure that you don’t touch both the positive and the negative terminals at once. Avoid any parts of the wire that may have exposed copper, as they do conduct electricity. When disconnecting your battery, you want to disconnect the negative side first and then the positive side. Remove the bolts or nuts that hold on the wires and then lift out the old battery by the handle. You can then put the new battery inside the space, tightening the positive side first and then the negative side. BONUS TIP: You should see a plus-sign for positive and a minus-sign for negative on the battery. Positive is usually red and negative is usually black, but it is important to be carefully, especially if you own a vehicle that comes from another country. If you are looking for more repairs and services that you can do yourself with the help of LaCava Brothers Auto Supply in Fall River, consider changing spark plugs, switching out worn windshield wipers, checking fluid levels, flushing the radiator, replacing the air filter, and much more. Give us a call at 508-676-1951 or stop by our location on Bedford Street to see our selection of Fall River auto parts and services.